More than 90 of Atlanta’s best restaurants and thousands of the South’s loveliest foodies gathered in Midtown for the 11th annual Taste of Atlanta. On Oct. 5-7, taste buds were rocked in the ultimate food lover’s experience. The block between Spring Street and 5th Street was taken over by folks wanting to sample the best cuisine their city had to offer. Plus the historic Biltmore building at the corner of 5th Street and West Peachtree provided a perfect backdrop for foodies to linger among the tents trying sushi, grits, chili, pizza and everything in between. Cooking demonstrations such as Clean Eating (food prepared by chefs Linda Harrell and Terry Walters of Les Dames d’Escoffier), Chopped Challenge: Facebook Face Off, Creative Loafing’s $20 Dinner, were just some of the dozens of events hosted by the city’s renowned restauranteurs this year. Seed Kitchen & Bar won first place for Best Taste on Saturday serving up an delicious crispy crostini with all the right flavors. The pimento cheese, smoky ham and fresh crisp apple served on a grilled toast point was the perfect dish for this fall afternoon. 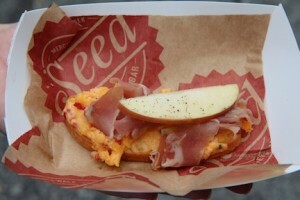 Seed is a newcomer to the Atlanta dining scene located slightly OTP in the Merchant’s Walk of Marietta. But chef/owner Doug Turbush certainly rocked palettes ITP this year at Taste of ATL. On Sunday, Best Taste went to Mi Cocina’s Ceviche – a delicious seafood cocktail swimming in lime juice and seasonings. Those with a sweet tooth weren’t tooth weren’t left hankering for more. 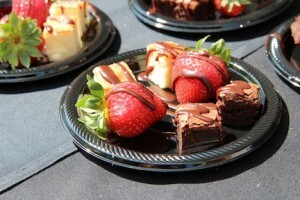 The Melting Pot was on-hand providing chocolate fondue drizzled atop fresh strawberries, pound cake and brownies (oh my!). Sublime Donuts was also on 5th Street right down the road from their shop serving up fresh pastries. And foodie’s were delighted to sample some of the first treats from The General Muir – a deli and bakery concept opening in 2013 down in Decatur from the same folks who brought y’all West Egg. Check back at PrettySouthern.com for more news on their progress. Big thanks to the ladies at Bravo PR and to Taste of Atlanta for letting Pretty Southern join them for this year’s event! Until 2013, we’ll leave y’all salivating. We sure are! 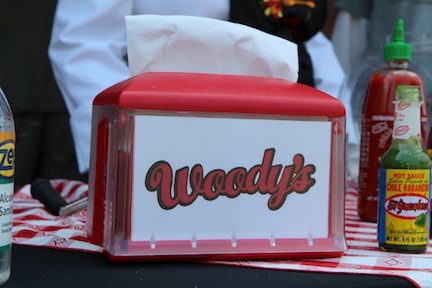 Here's a napkin from Woody's Cheesesteaks to wipe your mouth!